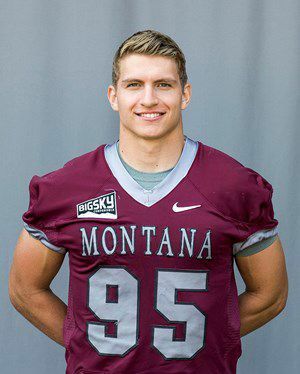 MISSOULA — A University of Montana Grizzly football player and graduate of Kalispell Glacier High School was found dead in his Missoula home Tuesday in what police believe to be a suicide. Andrew Harris' death was confirmed by the Missoula County Sheriff's Office. Missoula Police Sgt. Travis Welsh said police are investigating the scene as a suicide. He was 22. Harris was coming off his redshirt junior season and had played in 11 total games at Montana. He had moved to the defensive line for the 2018 season, playing in eight games and finishing the season with one tackle and 1/2 a sack. Harris was a first-team all-state player and captain for the undefeated Class AA state champion Glacier Wolfpack football team in 2014. He played for former Griz quarterback Grady Bennett at Glacier. His father, Greg Harris, played for UM from 1971-1975. His brother Josh was a defensive end for the Griz from 2008-2012. Harris was a business management major at the university. The University of Montana is deeply saddened to learn of the loss of one its students, Andrew Harris. Harris was a senior majoring in business management from Kalispell, Mont. He graduated in 2015 from Glacier High School and was a member of the Grizzly football team. Grizzly Athletics Director Kent Haslam indicated that Harris’ teammates, other student-athletes, coaches and staff were notified earlier today. Counselors will be available for any member of the University community — students, faculty or staff — who needs support.